Ishcgl is a picturesque and lively ski resort in the Tyrol ski region of the Austrian Alps. It is mostly flat with tarmac lanes and few inclines in the village making it very accessible. Cars are allowed in the village but when Ski 2 freedom visited (24th Nov 2012- first weekend of the season) there was not a lot of traffic. There are a wide variety of restaurants - from fine dining and pizzerias to traditional Austrian fare. Many of the restaurants are at street level making access easy. Ischgl prides itself on après-ski and nightlife. Bars such as Kuhstall and Feuer & Eis are situated very close to the Silvretta Gondola, perfect for a gluhwein after an exhilarating day on the slopes! The bars and restaurants usually offer après-ski from 4 to 7ish and then settle down a little for family dining until about 10. But don’t worry; if you are looking for a wild night, Ischgl is the place to be! Many of the bars stay open until the early hours and if you’re looking for something a bit different, how about one of Ischgl’s famous mountain top concerts. If you, a friend or family member have any of the following then Ischgl might work brilliantly for your ski or summer holiday. This is by no means an exhaustive list (it would be impossible to include every condition) but many have similar or common factors. As often someone may have a condition that we have not yet come across please do ask us if you are interested in the resort and we can try to help. Ischgl has a great selection of hotels, apartments and chalets suitable for all visitors. Accessible accommodation in Ischgl is also available for wheelchair users (dependent on type of wheelchair) and those with limited mobility. There is a wide variety of accommodation options. Many of the hotels in the centre of Ischgl are 4-5 star and offer a luxurious and comprehensive ski holiday experience. Many of these have entrances at street level and lifts making them very accessible. The Hotel Sonne, for example, offers especially designed disabled rooms. There are some more basic options further out of the centre, mostly around the the area of Mathon. A free ski bus transports skiers from these areas to the main gondola. For more information on mountain activities in Ischgl please contact us. The Ski Schule Ischgl has offices at the bottom and top of the Silvretta gondola. They are very experienced in disabled and adaptive skiing tuition and have approximately four instructors who have specific qualifications. 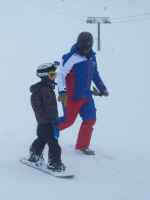 They also have experienced instructors in tuition for blind skiers and in working with people with learning difficulties. Their instructors are all fluent in German and English- some other languages may be available. The ski school does not own any specialist equipment but if an enquiry is made, they are able to book and obtain the appropriate equipment from Praschberger . Please note that this may have changed since last winter. The Ski Schule Ischgl has offices at the bottom and top of the Silvretta gondola. They are very experienced in disabled and adaptive skiing tuition and have approximately four instructors who have specific qualifications. They also have experienceir instructors in tuition for blind skiers and in working with people with learning difficulties. Their instructors are all fluent in German and English- some other languages may be available. The ski school does not own any specialist equipment but if an enquiry is made, they are able to book and obtain the appropriate equipment from Germany. Please note that this may have changed since last winter. To get a better idea and understanding of the ski resort of Ischgl and what else they can offer you for your holiday, we suggest you look up their website as every Tourist Office offers a fascinating and exciting insight into what they and the surrounding area can offer visitors. In addition many have a dedicated website or page for those who are in need of assistance, disabled, with young children and babies and those of us just getting on a bit in life! For more information on the ski resort of Ischgl itself we recommend that you also contact the Tourist Office. All the news, feedback articles and press releases illustrate how Ischgl helps to enhance people’s lives. Also, in many cases, showing how Ski 2 Freedom works in close association with Ischgl to help raise awareness of the empowering benefits of mountain activities such as skiing and promoting accessible, social and inclusive tourism. If on reading our Ischgl page, you have your own experiences and feedback of the resort (winter or summer) that you would like to share or feel would be encouraging to others, please do not hesitate to send them to us for inclusion on both our website and social media – photos and film clips also welcome.